If I could bring you to China now, it would be to share with you the country’s bold and magnificent landscapes. In my brief time living here I’ve hiked up mountains that touch the heavens, floated down rivers so serene they adorn the nation’s currency, and got lost in dense forests featuring every hue of green. Before arriving in China my mind was focused on the human feats that adorned the land – walls and warriors – but instead I have been moved even more so by the exquisite scenery itself. If I could take you hiking, I would start first at the famed Tiger Leaping Gorge. We would begin at the end of a dusty farm road, soon finding the trail that would shortly leave us winded with its steep ascent. We would look back at the river snaking through the valley, and grow more intrigued by the overwhelming peaks towards which we were heading. Pine needles would line the path beneath our feet, the fast-flowing river and cloud-topped mountain range our constant companion. We would tackle the 28 Bends, rewarded with a view of mountains melting into sheer cliffs that reach up into the clouds. We would sit on the rooftop of our halfway house, drink sweet milk tea and get lost watching birds disappear into the abyss. Walking as the sun came up, we would jump across waterfalls, wispy clouds chasing us along. The thunder of the Jinsha River, a tributary of the Yangtze River, would bid us farewell as it floods down one of the world’s longest and deepest gorges. If your legs could carry you further, we would skip over to Guangxi province to explore the Longji (Dragon’s Backbone) rice terraces. The hand-cut terraces trace smooth lines over the curves of hill, creating mirrored pools in the spring, rippling seas of green and gold in the summer, white steps during the winter. From the warmth of wooden village houses, we would watch the clouds swell and dissipate over the terraces, creating islands of green within the fog. Hiking between the towns, we would pass an endless hilly tapestry of rice, rushing with water from the ingenious bamboo irrigation systems. We would meet entrepreneurial Yao women along the way, their uncut hair wrapped around their heads in dark, shiny turbans. Having walked through untouched forests and past overgrown tombs buried into the hillside, our day would end as the rain set in, with bellies full of bamboo cooked rice. 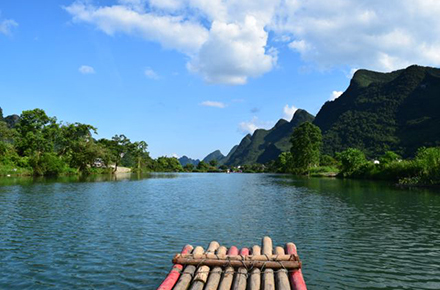 If you decided to share a bamboo raft with me when your legs were tired, we could float lazily down the Yulong River, greeting water buffaloes on the bank as we go. The Yulong and Li Rivers boast some of China’s most exquisite scenery, the wide bend of the latter adorning the 20 yuan note. We would sit in one of the world’s most glorious natural theatres, where the iconic karst mountains surround a bay on the Li River. There we would watch 'Impressions', a popular performance by 600 dancers who impart their reflections on the region. Despite being reproduced daily on an exhausting scale, it is a performance worthy of the Olympic Games opening ceremony, and is spine-tingling where the symphony builds to its full glory, reverberating around the karst mountains. If I could take you from rivers to lakes, I would bring you to Jiuzhaigou, a national park home to nine Tibetan villages. We would be spellbound by the fluorescent pools of shimmering turquoise, ice blue and vivid green. We would catch the spray from the waterfalls that rush through the forest, where gnarled trees grow out through the flow of the falling water. We would leave with photos of perfect reflections cast across lakes, so clear in their detail they feel improbable, especially in notoriously polluted China. If I could bring you to this land of epic proportions and striking diversity, you too would feel that there is an endless supply of National Geographic covers. If I could bring you here now, I would take you away from the cities and instead to the huge plains bordered by snow-capped mountains, the rainforests and to the rivers. And after that, I would take you to where I’m going next, the rooftop of the world – Tibet – and the big horizons of Xinjiang.